With many Bay Area synagogues and JCCs now offering programs that bring a Jewish twist to mind-body practices, it turns out there aren’t enough Jewish-infused yoga teachers to go around. That’s why the new initiative Embodied Jewish Learning is organizing a training program called “Yoga and Jewish Wisdom” that starts this month. “My goal is to have strong qualified teachers who are yoga certified and Jewish educated in every area in the Bay Area,” said Julie Emden, the director of Embodied Jewish Learning, a program of S.F.-based Jewish LearningWorks. Emden, who started the initiative in 2012, has been teaching yoga in Jewish institutions since 1998. Though she teaches between two and five classes a week at venues such as the Peninsula JCC, Temple Sinai in Oakland and the Berkeley Yoga Center, she said the demand for Jewish-infused yoga classes in the Bay Area is beyond what she can meet. “There are really different kinds of people coming to these classes,” said Emden, who was certified in yoga and Jewish spirituality through a program at the Elat Chayyim Center for Jewish Spirituality (now part of Hazon). Embodied Jewish Learning is part of the newest cohort at UpStart Bay Area, which trains and guides emerging Jewish startups. In conjunction with the Peninsula JCC, the new program will train six teachers. Over the past two years, the Peninsula JCC has been offering a full suite of Jewish movement and mindfulness classes, following a strategic planning process. The Peninsula JCC reached out to Emden, who helped the center develop programs around Jewish meditation, Jewish yoga, Hebrew chanting and nutrition in Jewish cooking. Emden begins her yoga classes by introducing a theme or line from a traditional Jewish text before moving into physical poses. She then works to connect the movement to the Jewish theme. For instance, a yoga class that begins with a line from the Torah about constructing a Mishkan (Tabernacle, or dwelling place) would end with the students considering their bodies as structures filled with spirit and breath. Yoga teachers who complete Emden’s training will be able to augment the already burgeoning selection of Jewish yoga classes available locally. Temple Isaiah in Lafayette offers neshamah (soul or breath) yoga classes twice a week. Congregation Rodef Sholom in San Rafael will offer yoga and meditation as part of an upcoming yearlong Mussar program focusing on contemplative movement. 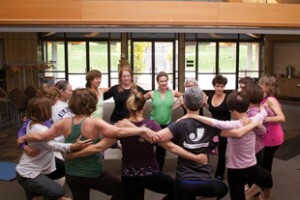 Additionally, Ellen Taffen, a member of Congregation Beth Am in Los Altos Hills, recently received a $1,000 microgrant from the Charles and Lynn Schusterman Family Foundation to organize five sessions of Israel-infused yoga at the synagogue. “Yoga for Israel,” taught by Keyko Pintz, focuses on bringing Israeli culture into the yoga class: Israeli music plays in the background and Pintz reads Israeli poems. A meal of Israeli food follows the class, which has been held three times.